Our tools provide several methods for sensitive data keys recovery and data decryption, but the first step is to estimate a number and types of encrypted records in a company file. QuickBooks Forensics search engine can be used for this purpose. Strings encrypted by QuickBooks are prepended with "AQAj777K" mark and are very easy to locate. cf_pref_attribute_value table record is usually encrypted company EMPID. abmc_account_user - bank account and routing number columns are encrypted. abmc_customer_credit_card_info - saved credit card numbers. abmc_vendor_user - vendor tax id column is encrypted. es_employee - employee tax id (SSN) column is encrypted. 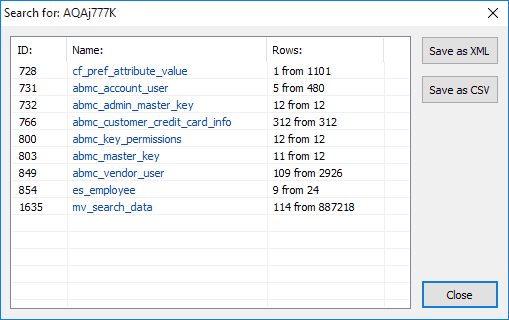 mv_search_data - records copied from tables above during data search in QuickBooks. Copyright © 2003-2018 Thegrideon Software. All trademarks, logos, product names & pictures mentioned or displayed herein are the property of their respective holders.